The original scheme for this trip was to ski some big lines in one of the more seldom visited, but undeniably magnificent areas of Southwest BC; The Tantalus Range. In the days leading up to the pre-trip however, conditions were far from in our favour, with heavy rain at treeline, and exceptionally heavy snow in the alpine. 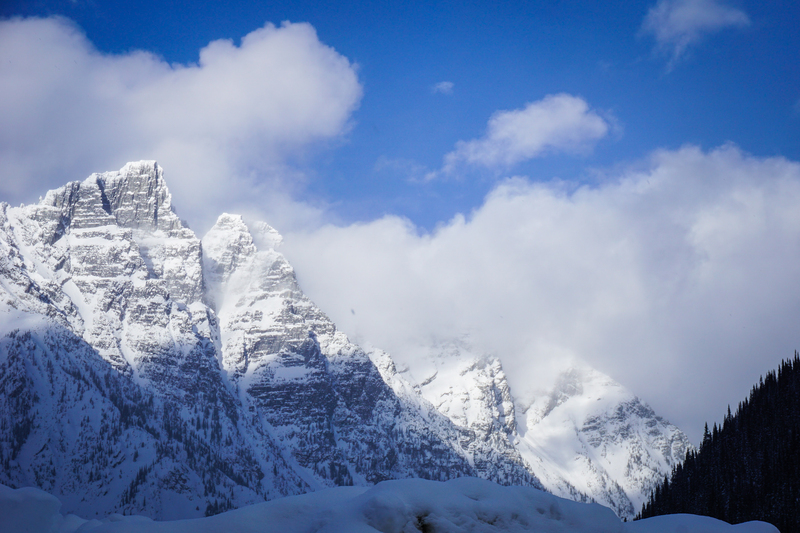 So we shifted our sights East, to Rogers Pass. 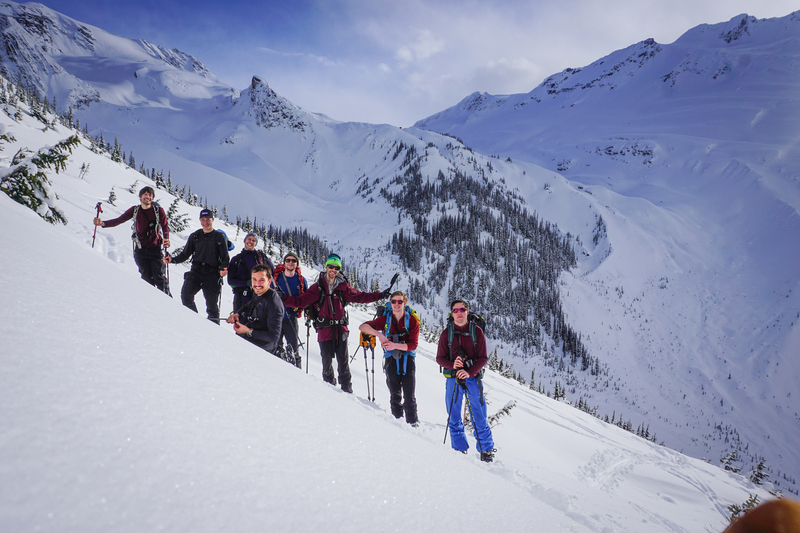 None of us were particularly upset by the change of plans, quickly enticed by the kilometre-long runs down the glaciers of the Selkirk range. 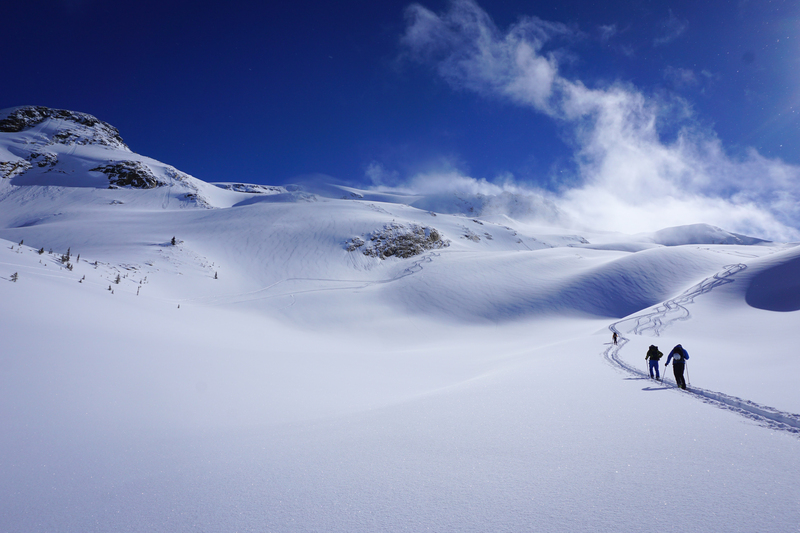 In my experience, multiday packs tend to impede steep skiing ability, and so it was decided that we would set up a base camp in a location from which we could embark on a series of day trips with nice light packs. As nice as a hut would be, they had long since been booked up, and did not agree with our student budget anyway, at $30/night. So 5 days of winter camping it is. We spoke to the Ranger to get our backcounty/parking permits sorted. The look of confusion on his face when we asked for camping permits suggested that this wasn’t something that was commonly done, infact in his entire time working there, we were the first to brave the elements and winter camp. We set off from the Asulkan Valley trailhead around 4pm. Around 30 minutes in Natan realized he had forgotten his whiskey in the car, a critical mistake which needed to be remedied. I waited while Natan skied back to the car to collect his essential camping supplies, while the rest of the group continued on to find a decent spot to set up camp for the next few days. A treed area in the valley 1.5km North of ‘The Mousetrap’ made for a great base camp. We began setting up tents and building our castle, complete with standing vestibules and wind barriers for tents, snow-caves for gear, and an oddly shaped kitchen table/ living room combo. That night and for the nights to follow we huddled around the table cooking and drinking whiskey to keep warm. Zack made some impressive beverages with a concoction of hot chocolate, baileys/amaretto, and a stick of butter, which he was kind enough to share with the group. Meanwhile, Natan brought along two large…sandwiches, which were passed around and got everyone kept spirits high. There was lots of laughter around camp that night; Natan was particularly amazed by a number of things, such as the fact that we somehow still had cell signal; and Zack’s non-stick pot. 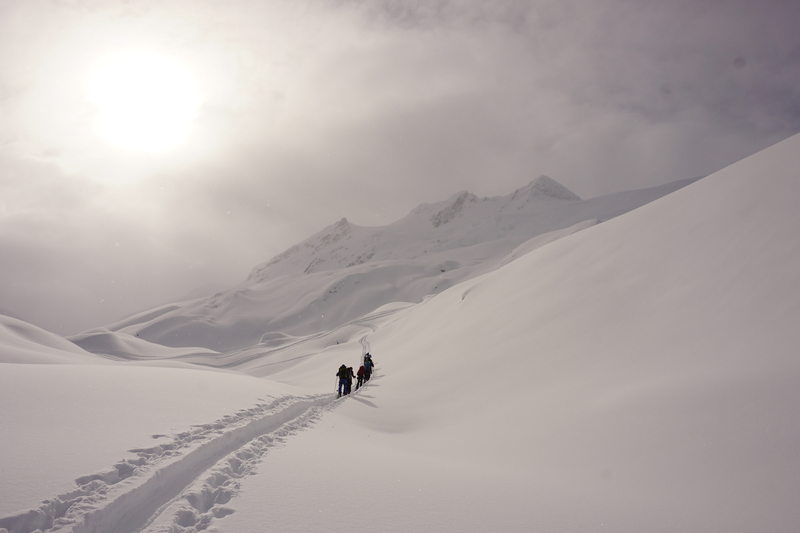 We set out around 10am the next day; quickly passing through the Mousetrap, a narrow gully at the terminus of several prominent avalanche paths, before heading up through the Tree Triangle towards the ACC’s Asulkan hut. The hut was said to sleep 10, but for sure it would be at least 35 by VOC standards. We rested up here for a little while, then headed out to do some sweet sweet skiing. 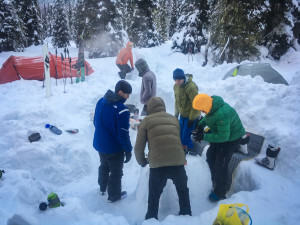 Zack dug a snow pit and did some science, conducting more tests than I knew existed; the results showed that the interior snowpack has a pretty good memory, with weak layers revealing themselves every 10-15cm. Fortunately it was still super skiable, so all 8 of us took turns ripping down the kilometre long run from the cabin to near the bottom of the valley. 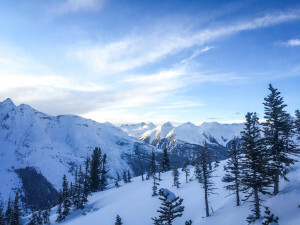 This run obviously left us wanting more so we made our way about 2/3 of the way up Lookout Mountain before dropping in for an incredibly fun run through sparse trees and 30-40cm of powder. On the way up we had gained and lost visibility several times as clouds passed around us, and ensured to take a cheesy family photo. When we got to the base of the slope we discussed the extent to which our group of 8 had absolutely ruined that slope for anyone else; this would be a ongoing trend for the days to follow. No fresh tracks for you. The skies cleared as we arrived back at camp, which made for amazing views of the surrounding peaks, and stars later that night. It also made for a cold evening around the kitchen table, which we all coped with in our own ways; Ilia and Tobias found it most effective to continuously boil water for about four hours straight, finding new meals and beverages to repurpose it into each time. The next morning I got up at 6:45am to announce to everyone the daily weather forecast. This was not appreciated as much as I had hoped. Turns out my temperature estimation of -3°c was slightly off (…14° off to be precise). When you’re crawling out of a frost covered sleeping bag in the morning the difference between -3 and -17 is quite arbitrary; it’s just cold. Needless to say this made the morning go a little slower than anticipated. 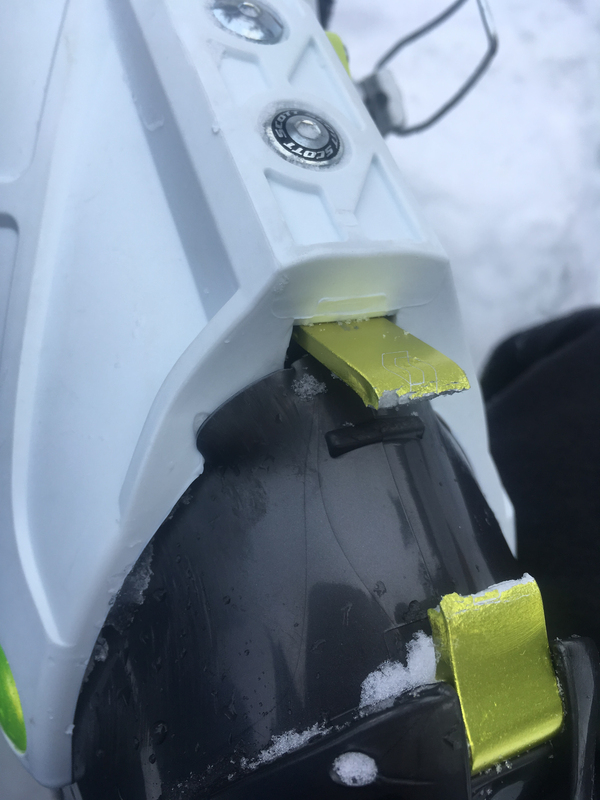 The vaporization point of isobutane is -12°c, so our canisters needed some TLC (being stuck in the armpit to warm up) before the fuel could undergo the necessary phase change from liquid to gas. Half full nalgenes foolishly left out overnight shared a worse fate. In fact, the rum and other spirits were pretty much the only thing that wasn’t frozen solid; it was decided that when the rum freezes, it’s time for us to call it quits, fortunately rum has a freezing temperature of -34°c, so we had nothing to worry about. Sort of. It was just before 9am that we were finally heading out from camp. We sped through the mousetrap and the tree triangle and regrouped at the Asulkan hut, before setting out on one of our foremost objectives for that week. Youngs peak, via the Seven Steps of Paradise. 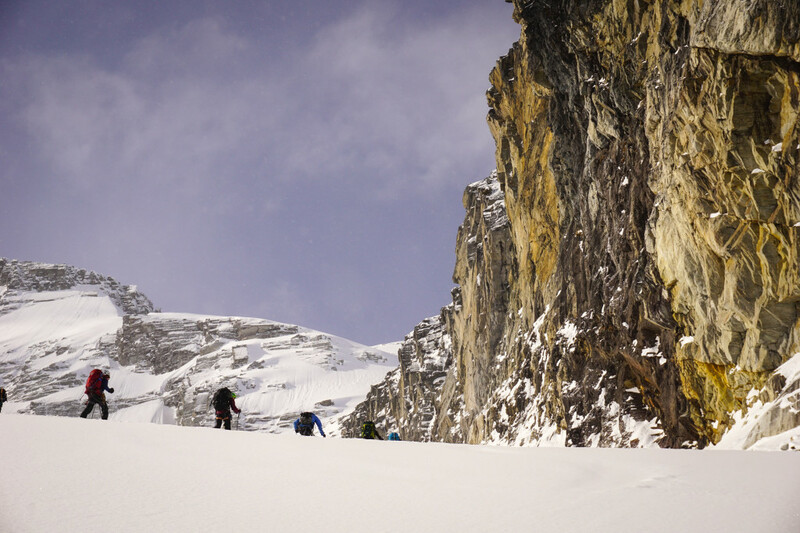 The route is aptly named, as it climbs the vast, rolling steps of the Asulkan Glacier. We kept a steady pace for the next couple hours, as clouds rolled in from both the North and South. 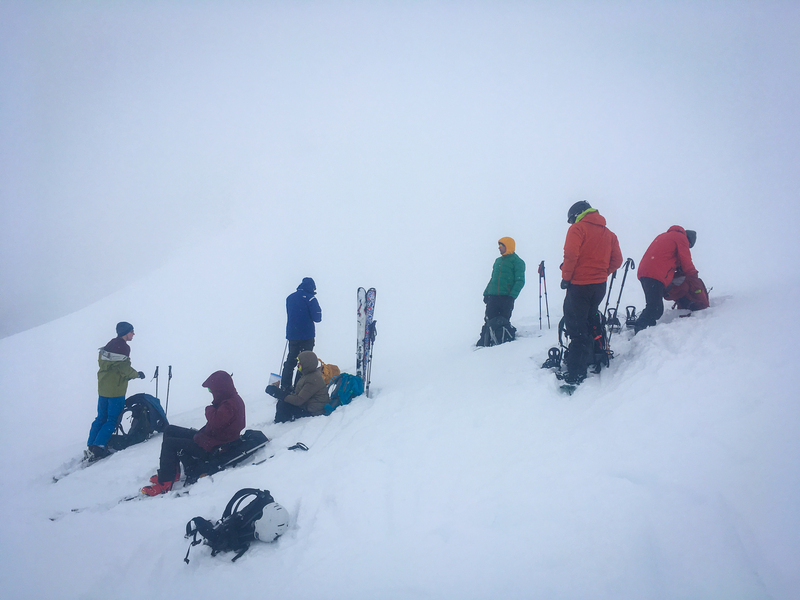 The Youngs Peak headwall was our ‘decision point’, thick clouds had rolled in by the time we got up there, so we decided to throw on some layers, endure the wind, and take a 15 minute snack break to see if the clouds would burn off. They didn’t, so we decided to call it there and make our way back down the glacier. 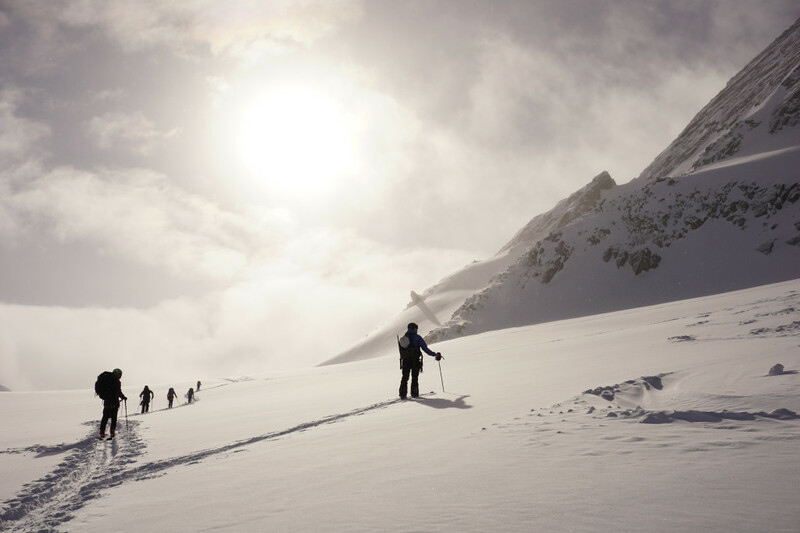 The skiing was stellar; as we cruised down the rolling slopes of the Asulkan glacier we passed a few groups, undoubtedly cursing us as we once again covered the pristine, powder covered slope with our 8 sets of tracks. We stopped briefly at the cabin to warm up, then 5 of us went back for another lap while the other 3 called it a day and made their way back to camp. Our group of 5 went back up about 4.5 steps, before dropping in behind the ‘Pterodactyl’ for an excellent, slightly steeper line that fed back into the valley. It was another cold, clear evening back at the campsite, we had begun to get used to the routine, but by this point the struggles of winter camping were really setting in; lighters refuse to work, water bottles freeze shut in less than a minute, and Natan fell into a tree well with his pants down. But somehow it’s always made worth it the next day. 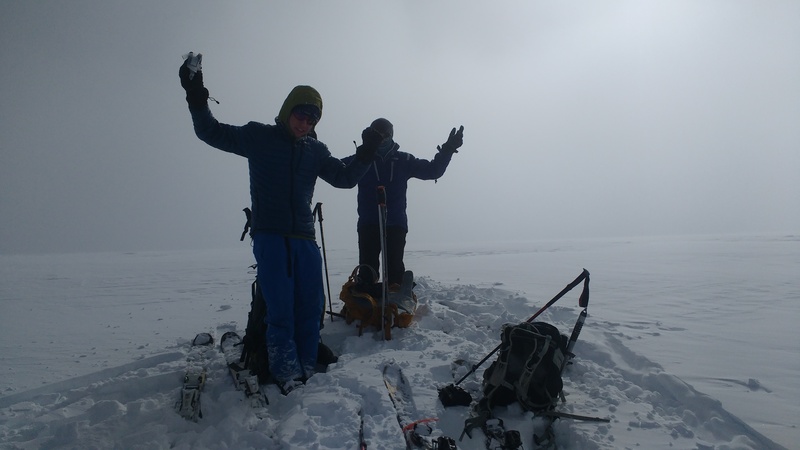 We were a bit more on top of things the following morning, packing glacier gear and heading out around 8:30am for that day’s objective; the Sapphire Col. We made our way up the Western portion of the Asulkan glacier, ascending past a serac, and prominent headwall known as ‘The Cleaver’. After only a couple hours we crested over the top of the Col, which lay between Dome mountain and Mt. Jupiter. The midday sun shone brightly down on the vast area before us, and strong winds drew patterns in the snow. We didn’t stick around for long at the Col, as the usual mid-afternoon clouds rolling in threatened visibility. 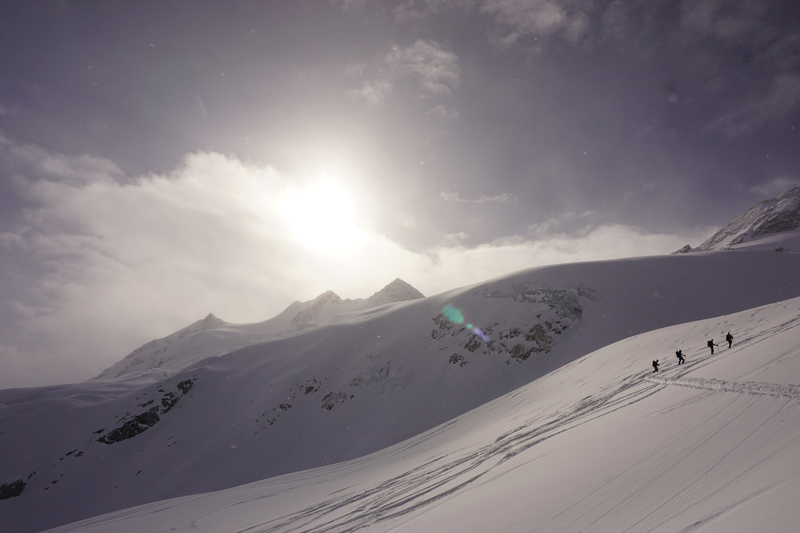 We once again cruised down the glacier, there was lots of hollering, cheers and fist pumps as we skied the glorious >2km run back into the valley, with a total change in elevation of just over 1000m. Unfortunately Bryan’s freebie EUS frosh sunglasses didn’t provide particularly good snow definition in comparison to a pair of ski goggles, so there was at least one good yardsale, and maybe a few more unforeseen snowbanks that were hit with some speed. I also took a pretty good bail after hitting a little concavity weirdly; a couple rolls and I somehow ended up back on my feet, obviously justifying the double fistpump celebration that followed. In the process somehow I managed to snap a fairly crucial component of my boot; not sure how I managed to snap a solid peice of metal in two, I call conspiracy. Bryan and I called it a day, while the others went out for another lap on one of the nearby slopes. We put a pretty good dent in the rest of the rum while waiting for the others. It had been decided earlier that day that Zack’s car would be heading out that evening to make it to an event in Whistler the next day. 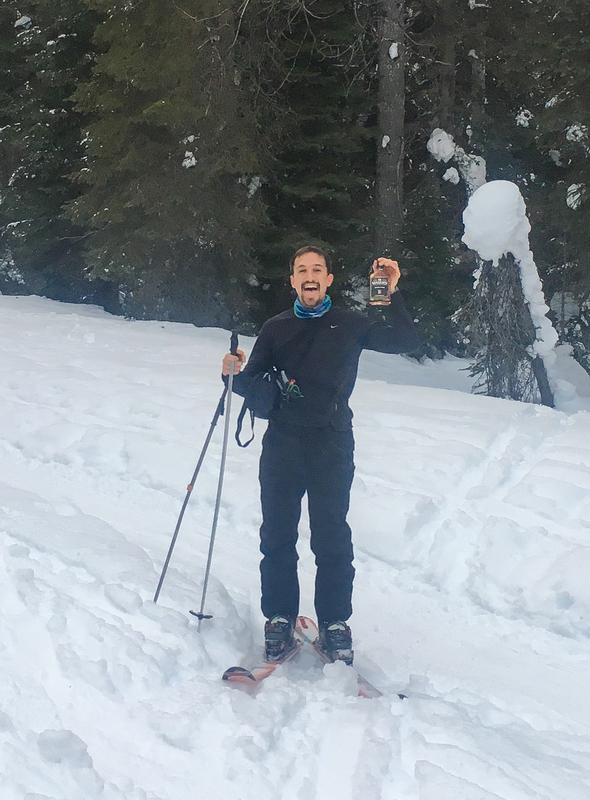 So when the skiing group returned to camp we decided to polish off our liquor and the rest of Natan’s sandwiches, and proceed to pack up gear for them to head out. This was not a logical order. Some time later the group was all packed up; we said our fairwells and they started the ski out back to the cars. Between the Zacks broken skins and some midly intoxicated group members, I’ve heard that the ski out took some time. Bryan ended up in the creek, though nobody is quite sure how he got there or why he was so okay with the fact that he was in the creek. The next morning, Tobias, Ilia, and Natan got off to an early start at 5am to make a second attempt on Youngs peak, and be back around midday for us to head out too. Meanwhile I stayed at camp with my broken boot and sulked took down the tent. 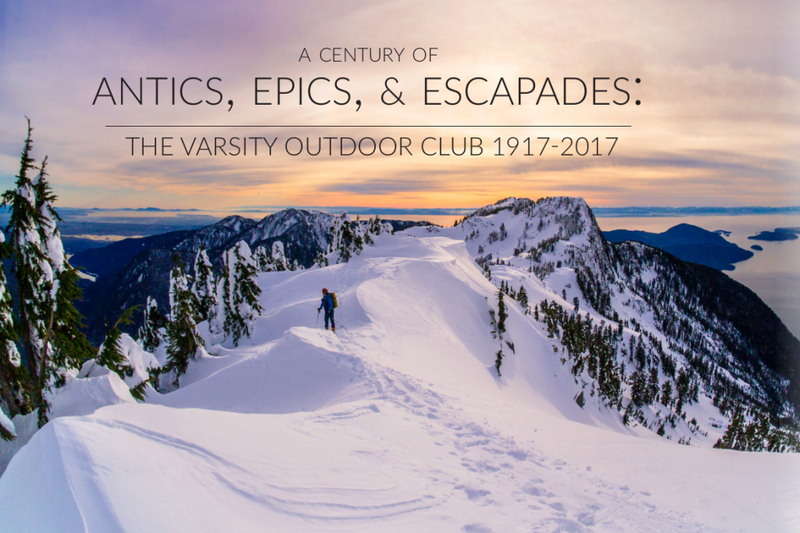 The 3 returned to camp in high spirits around 11:30am, having successfully summited Young’s Peak and gotten some ‘great’ views at the top, along with some more great skiing down the Seven Steps of Heaven, and Pterodactyl. Our group skied out later that afternoon, and headed back to Vancouver, stopping for a well earned burger in Revelstoke. As usual, there was a blizzard on the Coquihala, but nevertheless we made it back to Vancouver around 9pm that night. Most of the group met up for a beer on Sunday night. 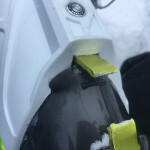 This entry was posted in Ski, Trip Reports and tagged 2wd, Asulkan Valley, backcountry, Camping, Intermediate, multiday, overnight, reading week, Rogers Pass, ski, ski touring, skiing, Snow, Winter. Bookmark the permalink. Good trip, good trip report. I hope others are reading it! haha epic trip and crazy events!